If you need to know what’s really important in a tablet design, you’ll be happy to know that I’ve done a LOT of research. In this article I pull all that knowledge together in a huge list of tablet improvements, based on the good old Samsung Galaxy Tab. 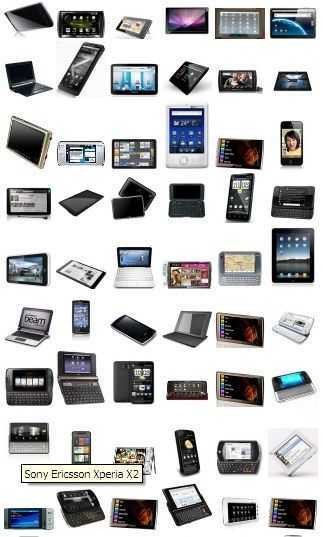 Also read: things to consider when designing or buying a tablet-style device. 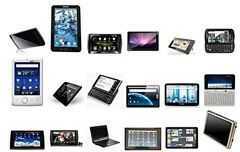 Acheckist for a quality handheld internet tablet. 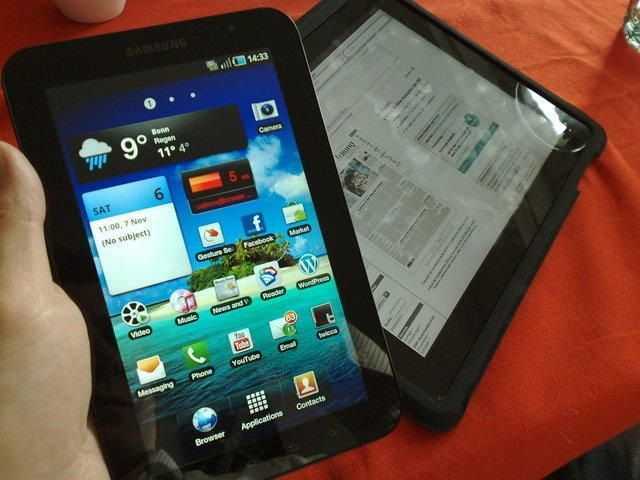 The iPad and Galaxy Tab were great, great examples of early consumer tablets in the market and for me the quality and mobility of the Galaxy Tab meant that it worked well in my family of devices. I’ve used it for over 3 years and in in the early monthf of ownership I compiled a list of issues and improvements. The list applies to other tablets too so if you’re designing or buying tablets for the market, this is the sort of list you should already have on your whiteboard. If not, take this one and make it better. The list is over 50 items long and is split into three sections. Changes that could be made to the current Galaxy Tab are listed first and this is a good place to scan through if you’re looking to buy a Galaxy Tab. The second section includes what I would call reasonable hardware expectations for second-gen or late 2011 high-quality tablet. I don’t expect all of these features to be included but it’s a list of possible improvements. The third section is a little way-out there and includes hardware changes that may not be possible this year or could be too niche. I did have a section including third party software but that list got very long indeed and is not really relevant here. IMPORTANT: There’s more to be added to this list and a great discussion about tablets to be had here. Chip-in with your thoughts too. You’ll have ideas that no-one has through of yet so don’t be afraid to dump them in the comments below. If it’s not too wild (lets keep it within a 2-year timeframe) i’ll add it to the list and credit you. Web browser. Faster, mouse/finger over. Higher quality. Plugins. Password sync. Common gestures. Protect the audio playback from stutters in multitasking scenarios. Critical. (How about a ‘dedicated’ mode where the application is brought to ‘realtime’ status, in effect, like iOS does. Vastly improved audio library features. playlist import/export, cross-fading, id3 tag editing, jukebox mode, cover retrieval, radio streams, integration with Last.fm amd similar services. Much quicker media scanning. Easier way to auto-organise applications list. Sort-by: most used, alphabetical, recently added, categorise (based on market categorisation) Apps list is as important as an audio catalogue. Genres, personal ratings on client should feed back to Market.There are a ton of improvements that can be made here. Samsung apps style improvements. Lose the wood-grain effect or allow theaming! Some feature improvements are also possible. More video content to buy / stream. Major issue outside the U.S.
Longer battery life (of course!) Important – battery save mode that schedules network usage. Significant improvements will require hardware changes. Better gallery with sort, date search, rename, tagging, face detection etc. Stock Gallery is very limited. Better printing support. Google Cloud Print service should fix this. Timed profiles, turn to silence. Improve speed of re-scanning WiFi access points. Can be extremely slow in some situations. Camera Quality: Glass lens, better sensor, continuous AF when recording video. Lens cover. Flash options. HD recording. Storage improvements. Speed of core storage needs improving. 32GB, 64GB option. Indicator lamps – multiple for use with different applications. Programmable colour. indicators and alerts need to feed to paired Android phones. Digitiser for graphics and handwriting input. HQ audio recording. External mic over BT? Array mics. Quick Fingerprint reader for security. Rear panel controls and gestures area. …and lastly. Lets have a penta-boot system with Windows, Android, MeeGo, Ubuntu and WebOS! This is not the first time we’ve discussed the crossover between pro/productive/full-os mobility and the continuing threat/opportunities offered by mobile operating systems. See: Mobile Changover â€“ What’s Your Plan? for more from June 2010. 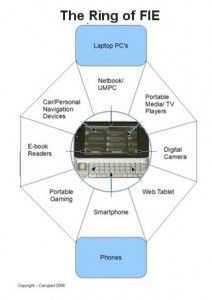 CES 2011 was an absolute whirlwind of crossover products and after a week of note-taking, I’ve put together a report. Following the crossover theme, I’ve published it over at Carrypad! Don’t forget, Meet:Mobility Podcast 62 covers a lot of this ground too and includes perspectives from JKKMobile and Netbooknews. Netbook Freeze Is More Than Just a Summer Break. Sasha, my good friend and fellow MeetMobility podcaster is one of those that has a lot invested in the keyword so it’s interesting to read his thoughts on it. In an article today he highlights the advances that the new platforms will bring and assures us that everything is going to be fine. If you can wait until February, he says, you’re going to have a big selection of new devices to choose from. I have a certain amount of my business effort invested in netbooks too. If the netbook hadn’t have arrived my company would have been dead a long time ago and, like the iPad, it makes people think and mobility, size and usability. I’m not so bullish on the future of netbooks though. There are a couple of data points I’m considering and a number of other thoughts. Google trends is hardly the best indicator of sales but it does indicate popularity amount searches and popularity amongst news items. Netbooks are certainly taking second place to tablets in terms of news right now and it seems that the slow down in news is also affecting users awareness of the platform. That will have a direct impact on sales. Searches for ‘netbook’ are now running at less than one fifth of searches for Android or iPad. 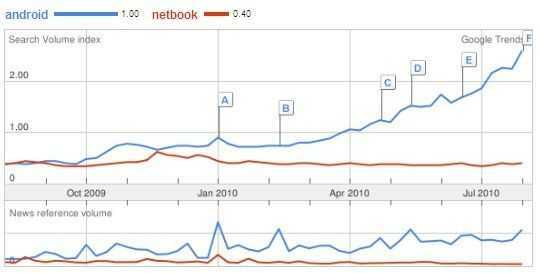 This time last year, Android and Netbook were attracting exactly the same level of search queries. 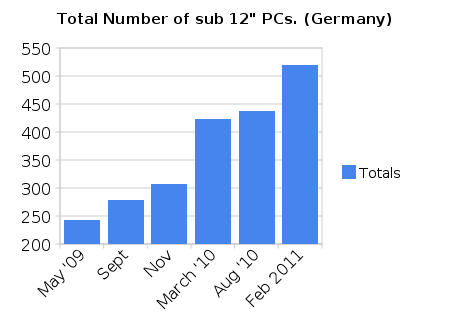 Having said that, there are almost the same number of queries for netbook as there were one year ago. Only the number of news articles has fallen. By analysing the German netbook market SKU numbers and the distribution of screen sizes over the last two years it can be clearly shown that the sub 10 inch market is long gone. The 10 inch market is flattening off in terms of new products and only the 11 inch segment is rising significantly. In this months analysis it’s also clear that the total numbers of products is flattening off which could be an indicator that growth has stopped in Germany. Again, the underlying trend is one of ‘flat’ rather than growth or decay. If this can be maintained, the netbook market will remain healthy but with new product launches sowing, it will be difficult to keep momentum. Of course, if devices are simply dropping the ‘netbook’ tag in their marketing then the devices may must be selling as ‘laptops’ although that in itself indicates that the netbook trend is over. 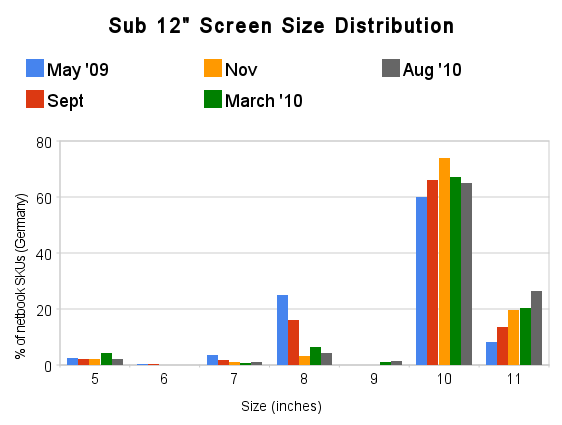 Based on simple screen sizes and weight figures, the traditional netbook market is already over for me. 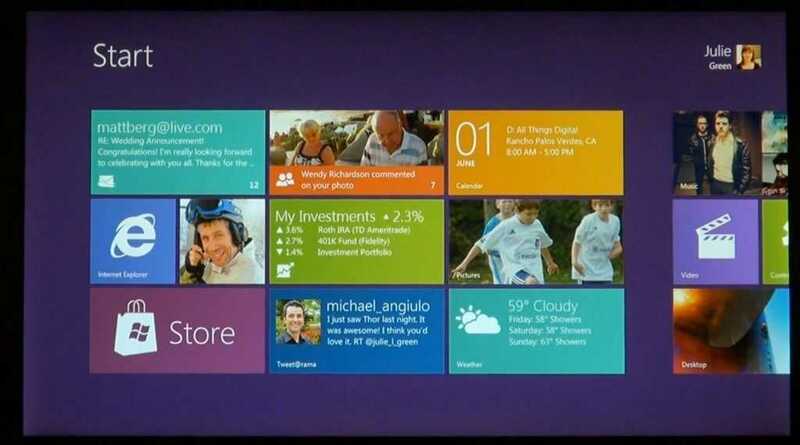 In a report from Morgan Stanley we find out that Intel have launched the Moorestown platform today. Update: Information is obviously under embargo at this stage but there are a string of tweets that have just gone through that mention Moorestown and a Z6xx processor. e.g. this one. “Intel Z6xx smart-phone processor prototypes: Moorestown massacre: Intel says that fantasy phone is on its way, wit…” They all link to a Cnet UK article that has obviously been removed. The current Menlow platform uses Z5xx processors. This makes sense. Update 2: Everything is official now. The Z6xx has been launched. Interesting news on Android too. Morgan Stanley have studied Moorestown and believe that Intel is ‘well positioned with MeeGo’ and that video performance will compare with the latest smartphone platforms, including Tegra 2. They also think that Moorestown will ‘meet or exceed’ current smartphone performance. It’s a bright report that will definitely give the ARM ecosystem partners something to think about. update after actual Moorestown data become available. more favorably on processing power benchmarks. See also: UMPCPortal Moorestown analysis here. Considering that this report is focusing purely on Intel’s smartphone processor and this statement appears in a section on MeeGo, the report implies that the Nokia phone will be based on Intel’s Moorestown platform and running MeeGo. Stand-by for official Moorestown launch info! Thanks to the great crowd at DevMob2010 in London last week, I’ve had some good feedback to my scenarios and segmentation diagram which was originally created in 2006 and is now updated and re-published under CC license. It should help as a stimulus for software developers thinking about the possibilities in the space between smartphones and netbooks and can help device designers to think about usage scenarios. Customers will also find it useful to pick out their own usage scenarios and to see what type of device fits with their requirements. FEEDBACK IS ENCOURAGED. If you have thoughts, please add them to the comments section below. During my session at DevMob I had a set of suggestions which I’ve added to the diagram. 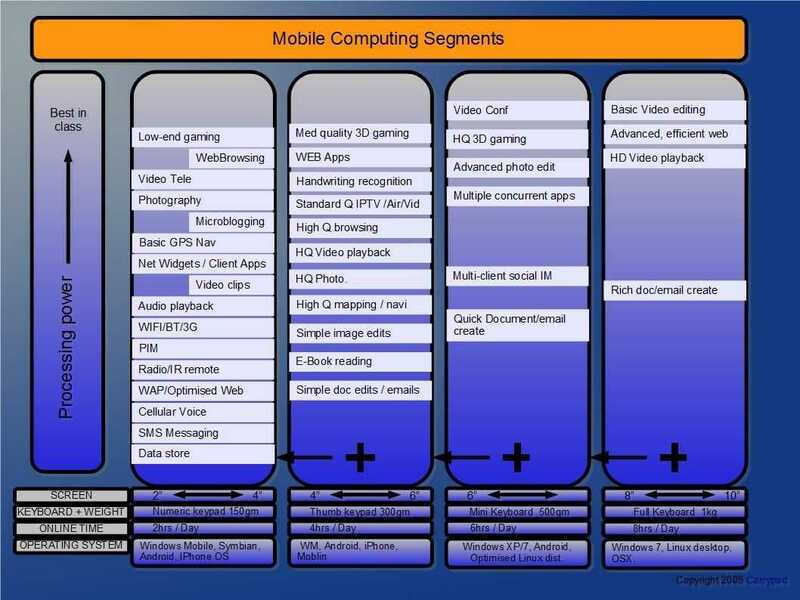 It was interesting to hear suggestions for the 8-10 segment which included Multi-touch/User gaming (many players, one device) and multi-person video viewing. Those are two models that the iPad is targeting very closely. We also added ‘Media Overview / Chooser’ to the 8-10 segment based on the need for screen space for an overview of images, album cover art or video’s. Many thanks to all that took part in the sessions at DevMob and thanks to all of you that took the time to present and talk about your ideas in this space. I hope to see you all again at the next DevMob2010 and at other events in Europe. Notes are shared in a Google Document here. Update: I’m experimenting with a slightly different layout based on feedback below. The segments have been re-drawn to represent a more fluid crossover point. Click for full size jpg image. Thanks to Intel for sponsoring my trip to London for DevMob and to the Soft Talk Blog team [twitter] for their assistance. 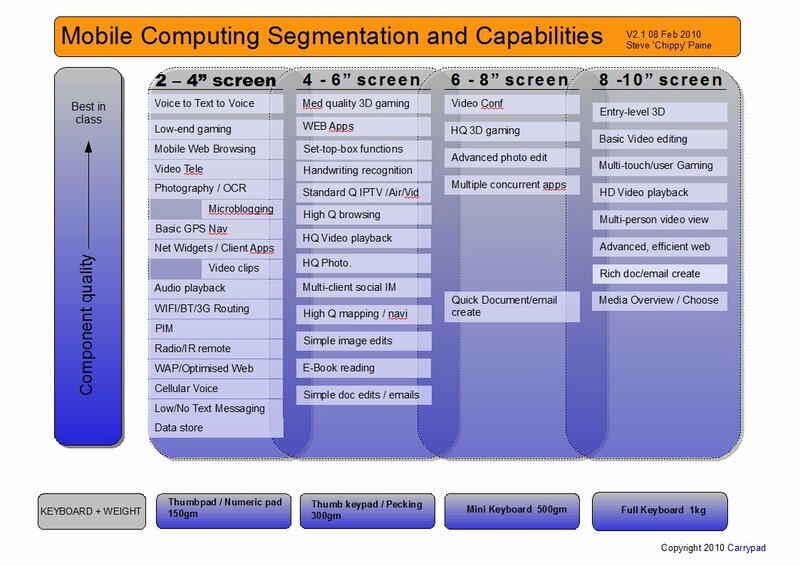 Mobile Scenarios and Segmentation by Carrypad is licensed under a Creative Commons Attribution-Share Alike 3.0 Germany License. Everyone is free to make their own definition of a MID. Intel like to define it as a pocketable web-capable device. Dell used the expression for netbooks at one point and I’ve talked about a wide-ranging Ring of FIE (right) which includes MID-like, internet-connected devices that don’t even need a browser. It looks like ISuppli take a similar idea and use it for their definition of a mobile internet device. EETimes reported a few weeks ago. ISuppli (El Segundo, Calif.) defines MIDs as devices that have integrated connectivity for wireless local area network (WLANs), wireless metropolitan area networks or 3G-or-higher worldwide wide area networks. They also must a maximum-sized display of 8-inches in the diagonal dimension, an instant-on function, an always-connectable capability and a full day’s worth of battery life under typical usage scenarios, according to the firm’s definition. Far enough. But what about the statement on smartphones? 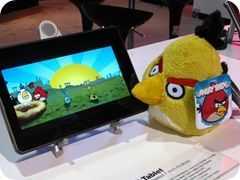 Smartphones are projected to dominate the MID segment in the forecast period from 2008 to 2012, iSuppli said. The firm estimates that about 60 percent of all smartphones now are considered MID-class devices, but that figure will rise to cover 100 percent by 2012. I agree that smartphones (if we continue to call them that) may dominate numbers as they move up the chain in terms of sizing, software and processing capability but I certainly wouldn’t class 60% of all smartphones as MIDs today. As I said, definitions vary so despite my reservations about those smartphones, if you’re researching the sector you might want to be buying a copy of the ISuppli report. UMPCs. Add WWAN, Sell more! I have no problem agreeing with what InStat are saying in their latest report. "Embedding a wide-area wireless modem into devices addresses the frustration many users have with the coverage of Wi-Fi." For me, wireless wan connectivity is an absolute must for a ultra mobile PC and anything without it is just portable between hotspots but I do also understand that there are problems for OEMs too. Adding 3G to a product requires more certification expense, assembly-line options, adds cost and is difficult to research on a global territory basis. This is why you see OEMs like Raon Digital offering base systems that resellers can tailor for their own customers. 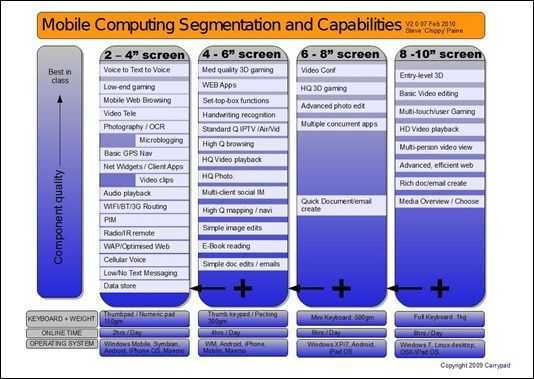 It’s also why Intel have a modular 3/4G option in their Menlow platform. There are also people that aren’t quite as mobile as others using multiple WLAN locations as hot-desks or even working within a single hotspot area. Tethering and USB sticks also provide an option but as carriers get their backbones ready for this new class of netbook and UMPCs and as 3G USB stick margins drop, they will start demanding that devices come with 3G built in. If OEM’s want to get their devices into these potentially huge sales channels, they need to comply. 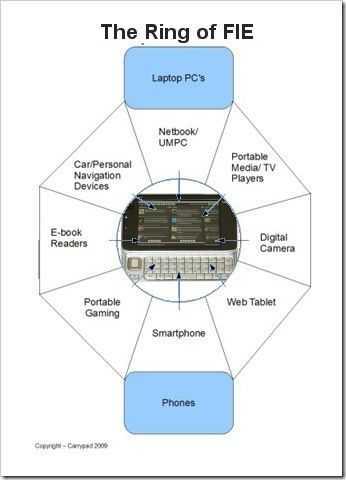 The InStat report also covers ultra mobile PC market predictions. Unfortunately there aren’t any hints as to what they think the market is worth and even what a ultra mobile PC or UMD is. 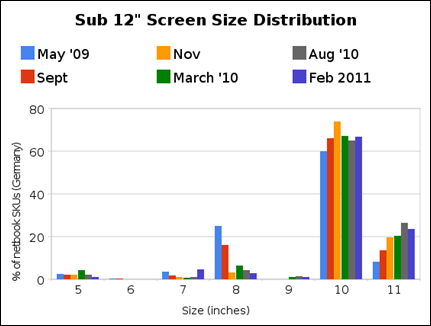 For what it’s worth, I don’t think there’s going to be too much growth in the traditional ultra mobile PC market (productive, 6-8" screen, lightweight mobile computing hardware running desktop software) this year due to lower-cost netbook options and fairly static vertical markets and solutions but if you look at lower down in the market at 4-5" devices, there’s something starting to happen. Viliv, Raon, UMID, Fujitsu, Wibrain, Lluon and others are all in with new devices. Some may call them MIDs but when they running Windows and looking exactly like the Origami marketing dreams of 2006, you’ve got to consider them as UMPCs.